Here is something investors want: higher bond yields. Here is something investors fear: rising interest rates. 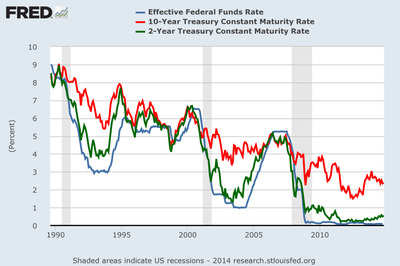 Higher bond yields won’t become a reality until interest rates rise. A post from ThinkAdvisor’s Janet Levaux on Wednesday, which was pointed out to us by Bloomberg’s Mary Childs, cites a poll from Franklin Templeton Investment that shows the contradiction in the desires of fixed-income investors. The poll found that 50% of bond investors say low bond yields are a “top concern” when investing in fixed income, while 74% of investors worry about how rising rates will affect their portfolio. The poll also found that 71% of investors believe rates will be higher in 2016. According to Franklin Templeton’s poll, 48% of investors know that bond prices go down when interest rates go up, indicting that a majority of bond investors are unaware of how these assets work. The main reason bond yields won’t rise unless interest rates rise is that bond yields are sensitive to interest rates. When interest rates rise, the opposite happens. Bond investors should get their story straight.